This is a sneak preview of The Rifter® #73. This sneak preview includes the front cover, credits, contents, "From the Desk of Kevin Siembieda," Palladium News and 2016 convention information, a list of coming attractions, an excerpt from the Triumvirate Dragon for the Palladium Fantasy RPG® and other games, an excerpt from the Forest Children for the Palladium Fantasy RPG®, the complete Risinor Dragon Stallion description and stats, an excerpt from The Nexus Born for Rifts®, an excerpt of official source material for Splicers®, and a Palladium Product Checklist. 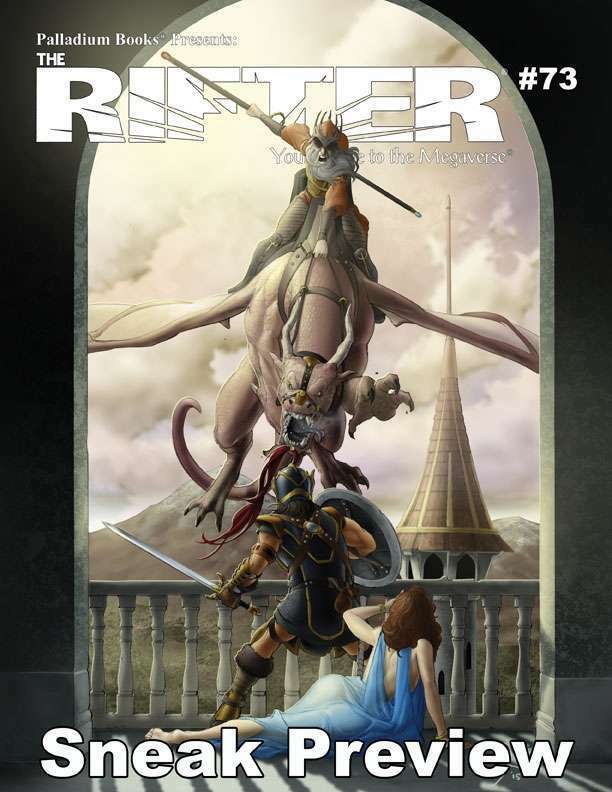 The Rifter® #73 will be available in February, 2016. For more information, please visit our website. This title was added to our catalog on February 12, 2016.